Should Apple divest the Mac? Put another way, should it take advice from the serially incorrect? John Dvorak is a perpetual troll machine that defies the laws of thermodynamics. Science is at a loss to explain it. Also, science asked how we got their number and could we please stop calling because they’re working on actual science and don’t have time to be props in the Macalope’s little jokes. Which are different than Dvorak’s jokes. A dumb idea whose time has come. Won’t you please give dumb a chance? This year when you vote, please vote dumb. I get suspicious over seemingly minor little changes. I see conspiracy in everything. The rabbits whisper to each other about me. Anyone can see that. And what of the mailman? What secret agenda is he operating under? The Postal Service’s? HA. No, clearly he is an agent of Cobra. Although, the Federal government is also out to get me. 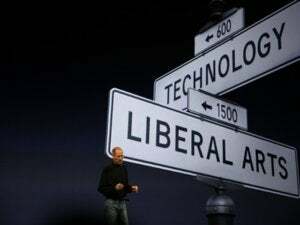 A recent "little change" got me thinking that Apple might spin it off its computer division into something I'm calling the Macintosh Computer Company: the renaming of OS X back to MacOS. Would you be surprised to learn that Dvorak fails to mention that the move was made so the naming convention for all Apple’s operating systems would be the same? No, you wouldn’t, because you judge things based on facts instead of acting on your fever dreams. That’s one of the things we love about you, Martha. …Apple has failed to make any major upgrades to its MacBook lineup in over a year, prompting complaints from pundits and the public. If five people complain you can just call them “the public.” Who’s gonna stop you? Not PC Magazine, apparently. It also allows the Mac to break free from the Apple walled garden, which seems to be centered on the phone, giving the computing platform more versatility outside of the Apple enclave. Apple just devoted much of a keynote to pointing out features designed to make its devices work together seamlessly. But based on a name change that brings all the company’s OS names into better alignment, Dvorak thinks the company is splitting up. Or, well, he probably really doesn’t, he’s just saying he does because PC Magazine keeps funding his crappy performance art for some reason. The Macalope has an idea for his own performance art. 1,000 people dressed in ridiculous pigeon suits swarm over John Dvorak. There is much cooing and flapping of wings, feathers fly everywhere. When they disperse, Dvorak is gone. He’s fine, he’s just forced into retirement. Anyone know anyone at Improv Everywhere?